Much like apple pie and ice cream, traveling and photography just seem to go together. Most of us wouldn't dream of going on vacation without our cameras. For the millions of Americans who pursue a serious interest in photography, vacations offer a prime opportunity to exercise their creative urge and to improve shooting skills. A host of travel companies catering to the interests of photo enthusiasts has sprung up in recent years. 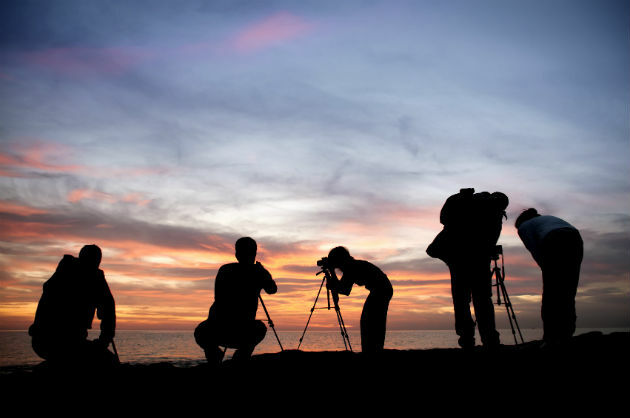 These companies offer a wide variety of photo safaris — guided field trips to destinations noted for their photographic attributes. Just as avid anglers might hire a fishing guide to lead them in quest of trophy trout, photo enthusiasts can do the same. Whether you'd prefer to capture images of the multicolored cliffs and sandstone sculptures of Utah's canyon lands, the frosty environs and winter wildlife of Yellowstone National Park, or the concrete canyons of the Big Apple — there's likely a photo safari to take you there. Safari-goers — like those aforementioned trout fishers — will find their expert guides know where to go for "trophy" photos and when to be there for the best light. You'd have to spend days scouting locations on your own to figure out what your leaders already know. You'll travel with a small group of like-minded souls, under the guidance of one or more pro photographers who willingly share their talents and expertise to help you create better photos. While there are photo safaris to the far corners of the earth — from Africa to Antarctica — you might be wise to choose something closer to home for starters. Not only does the U.S. offer enough world-class scenery and wildlife to keep your shutter clicking for a lifetime, but domestic safaris also cost far less than their foreign counterparts. If the prospect of joining a safari interests you, here's a roundup of offerings from some of the nation's top photo safari operators. Joseph Van Os Photo Safaris is celebrating its 38th year as the pioneer and preeminent player in the photo travel industry. Under the leadership of Jo Van Os, a noted wildlife photographer and former ornithology instructor for the National Audubon Society, this organization carries out more than 50 safaris a year to locations around the world. Nearly two dozen domestic trips are offered annually, focusing on Alaska and the American West. Van Os has assembled an all-star cast of 30 leader-guides, including such big-name nature shooters as John Shaw, Stuart Westmorland, Perry Conway, Jeff Vanuga, and Joe and Mary Ann McDonald. For this talent and the many other first-class aspects of Van Os safaris, you can expect to pay premium rates. Most tours are seven days, and prices start at $2,850. Enjoy the unparalleled opportunity to take your camera on the road alongside a seasoned National Geographic photographer. It seems only natural that a magazine so dedicated to exploring the world and so famous for its photography would step forth with a program of photo expeditions. Probably no one could do it better. You'll visit extraordinary places and learn techniques sure to improve your photography from pros like Michael Melford, Mark Thiessen and Susan Seubert. Designed for photographers of all levels, NatGeo's several dozen expeditions extend globally from Mongolia to Morocco and include a half-dozen or so North America itineraries — Alaska/British Columbia, Yellowstone and Yosemite National Parks, Columbia & Snake Rivers, Baja California's Sea of Cortez, Cuba and Costa Rica/Panama. These trips range from 6-15 days, with prices starting at $3,975 including lodging/meals — in some cases onboard one of the Society's 62-passenger expedition ships, Sea Bird or Sea Lion. This one stands out as one of the country's elite photo touring and workshop organizations — based on the considerable reputation of founder Adam Jones. He's one of the best in the business when it comes to nature and travel photography, and his images are seen in magazines, books, posters, calendars and advertising campaigns in more than 50 countries. Jones is also a skilled and experienced instructor, having conducted photo safaris and workshops for the last 20 years. Jones personally leads about a dozen photo tours and wildlife workshops a year. Two or three visit foreign locations, and the rest concentrate on domestic locales that, for 2015, include Great Smoky Mountains National Park, the Palouse region of Washington, the Oregon Coast, a fall foliage trip along the Blue Ridge Parkway — and wildlife workshops in Minnesota, Florida and Montana. Safaris and workshops usually run from 3-5 days and range in price from $895 to $1,495 (not including transportation, food or lodging). This tour is the passionate enterprise of Wyoming wildlife and landscape photographer Daryl L. Hunter, who says he's "polished his skills chasing grizzlies and mountain light" in Grand Teton and Yellowstone National Parks since 1976. Hunter's half-, full- and two-day tours focus on the greater Yellowstone eco-system — a region where two of the nation's most photographed national parks abut in scenic splendor and share an amazing abundance and diversity of wildlife. Hunter knows the parks intimately from years of guiding private photo tours — along with fly-fishing, snowmobile and horseback tours — and his outings will post you in beautiful locations for stunning landscapes and great wildlife images. Potential photo ops include bison, elk, moose, black and grizzly bears, pronghorns, wolves and such feathered creatures as owls, eagles, swans and ospreys. Instruction to help you hone your skills and refine your personal style is all part of the deal. Prices range from $595 for a half-day tour to $2,095 for two days and include pickup at your hotel, lunch/snacks and the use of various Canon and Nikon telephoto lenses. With more than a dozen walking tours, NYC Photo Safari combines photography instruction with in-depth sightseeing for small groups and individual shutterbugs wanting to learn how to capture the allure that's distinctively the Big Apple. Conceived and operated by a group of six professional photographers — all with impressive credentials — NYC Photo Safari's guided tours range from short but intensive 90-minute to two-hour sessions devoted to single subjects such as the Brooklyn Bridge, Central Park, Grand Central Station and the Metropolitan Museum of Art, to the "Manhattan Photo Boot Camp" that entails three 6-9 hour days of shooting with as much as four hours a day of walking. Most popular is the "Iconic New York City Photo Safari" that leads eight participants on a fast-paced, three-hour mission to photograph such landmarks as Rockefeller Center, Radio City Music Hall, Empire State Building, Central Park and Times Square. A separate tour takes in Times Square after dark. Tours are reasonably priced, ranging from $85-120, except for the Boot Camp, which tops out at $1,150.